LG Stylus 2 Plus presents IPS LCD capacitive touchscreen, 16M colors, It offers a big size of 5.7 inches (~72.6% screen-to-body ratio) that is very suitable in watching videos, browsing the Internet & playing the games, It comes with a superb resolution of 1080 x 1920 pixels (~386 ppi pixel density). 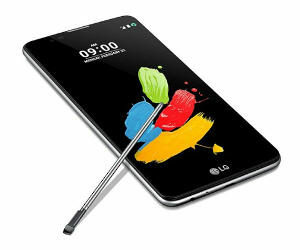 LG Stylus 2 Plus offers a high pixel density that makes the screen clear, It provides you with multitouch feature, It contains Corning Gorilla Glass 3 for the screen protection, It includes Stylus and it is also known as LG K530 , LG K535. LG Stylus 2 Plus offers Android OS, v6.0 (Marshmallow), It comes with chipset of Qualcomm MSM8937 Snapdragon 430, It includes a superb CPU, It offers Octa-core 1.2/1.4 GHz Cortex-A53 and it gives you Adreno 505 which gives you better 3D experience in playing your games. LG Stylus 2 Plus offers an amazing primary camera of 13 or 16 MP, autofocus, LED flash, It comes with amazing features such as touch focus, geo-tagging, face detection & panorama, It comes with video of [email protected] and it offers a superb secondary camera of 5 or 8 MP, LED flash. LG Stylus 2 Plus contains 2G bands GSM 850 / 900 / 1800 / 1900 – SIM 1 & SIM 2 (dual-SIM model only), It comes with 3G bands HSDPA, It brings 4G bands LTE, It includes speed of HSPA 42.2/5.76 Mbps, LTE Cat4 150/50 Mbps, It offers GPRS Class 33 and it presents EDGE Class 33. LG Stylus 2 Plus is announced in May, 2016, It will be released in June, 2016, It has body dimensions of 155 x 79.6 x 7.4 mm (6.10 x 3.13 x 0.29 in), It is slim as it is just of 7.4 mm, It comes with an affordable weight to carry as it has a lightweight of 146 g (5.15 oz). LG Stylus 2 Plus provides you with a wonderful expandable memory via card slot, microSD, up to 256 GB (dedicated slot), It contains a superb internal memory of 16/32 GB, It comes with 2 GB RAM – K530, It offers 16/32 GB, It has got great 3 GB RAM – K535 that is very suitable in multitasking. LG Stylus 2 Plus offers a loudspeaker, You can enjoy Sound Alert types such as WAV ringtones, Vibration & MP3, It presents 3.5 mm jack and it gives you Comms WLAN such as Wi-Fi Direct, Wi-Fi 802.11 a/b/g/n, dual-band & hotspot. LG Stylus 2 Plus contains Bluetooth v4.1/v4.2, A2DP, LE, It provides you with GPS, with A-GPS, GLONASS, It offers NFC feature, It brings FM radio, It comes with micro USB v2.0 and it presents a rich number of wonderful sensors such as fingerprint, accelerometer, proximity & compass. LG Stylus 2 Plus offers superb messaging such as Push Mail, SMS, MMS, Email & IM, It offers Browser HTML5, It contains MP4/H.264 player, It provides you with MP3/WAV/eAAC+ player, It includes a photo/video editor and it presents a document viewer. LG Stylus 2 Plus presents a removable Li-Ion 3000 mAh battery, Stand-by is up to 315 h (3G), Talk time is up to 7 h 30 min (3G), It comes with misc colours such as titan, gold & brown and it gives you Single SIM (Nano-SIM) or Dual SIM (Nano-SIM, dual stand-by). LG Stylus 2 Plus display offers a Full HD screen resolution of 1080 x 1920 pixels, It presents a stunning screen-to-body ratio, It offers a wonderful rear camera that has high quality pictures and it contains a fantastic front facing camera for superb selfie shooters. LG Stylus 2 Plus comes with amazing connectives, You can enjoy Wi-Fi, Bluetooth, USB, 3G, 4G & NFC, It comes with a superb performance that has no lags, It offers 4G in India (Band 40), It offers an ambient light sensor, It comes with a high battery capacity that last for a long time and it has a user replaceable battery. LG Stylus 2 Plus does not offer Java, It should have been Snapdragon 650, The battery capacity should have been better, It does not contain Infrared, It has no USB OTG, It does not offer gyroscope, It does not present barometer or Temperature sensor.